Area: 2.02 sq. km. (including new sea wall); about the size of New York City's Central Park. City: Capital: Monaco, pop. 30,539 (July 2011 est.). Climate: Mediterranean with mild, wet winters and hot, dry summers. Nationality: Noun and adjective: Monegasque. Annual population growth rate (2011 est. ): -0.124%. Ethnic groups (2011): French 47%, Italian 16%, Monegasque 16%, other 21%. Languages: French (official), English, Italian, and Monegasque. Education: Years compulsory: 10, ages 6-16. Attendance — 99%. Literacy — 99%. Health (2011 est. ): Infant mortality: 1.79 deaths/1,000 live births. Life expectancy — 85.77 years male; 93.84 years female. Birth rate (2011 est.) — 6.94 births/1,000 population. Death rate (July 2011 est.) — 8.28 deaths/1,000 population. Branches: Executive: Prince Albert II (chief of state), Minister of State Michel Roger (head of government), Council of Government (cabinet under authority of the monarch). Legislative — unicameral National Council (24 members). Judicial — Court of First Instance, Court of Appeal, High Court of Appeal, Criminal Court, Supreme Court. Subdivisions: Four quarters (quartiers) — Monaco-Ville, La Condamine, Monte-Carlo, Fontvieille. Political parties: Union for Monaco (UPM), Rally and Issues for Monaco (REM), Monegasque Party (PM). 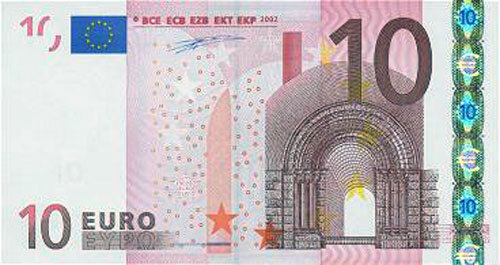 GDP (2009): 4.002 billion Euros (U.S. $5.467 billion). Avg. annual growth rate (2009 est. ): -11.36%. GDP per capita: 54,464 Euros (U.S. $74,404). Work force (2010; 49,276): Private sector — 45,147; public sector — 4,129. Banking — 2,748; hotels — 7,338; retail — 4,223; construction and public works — 5,715; industry — 2,967; transport — 1,543; other — 22,301. Agricultural products: 0.48% of GDP. Industry: Types: tourism, construction, chemicals, food products, plastics, precision instruments, cosmetics, ceramics. Trade: Imports (2010): 666 million Euros (U.S. $909 million). Exports (2010) — 536 million Euros (U.S. $732 million). Note: full customs integration with France, which collects and rebates Monegasque trade duties; also participates in EU market system through customs union with France. 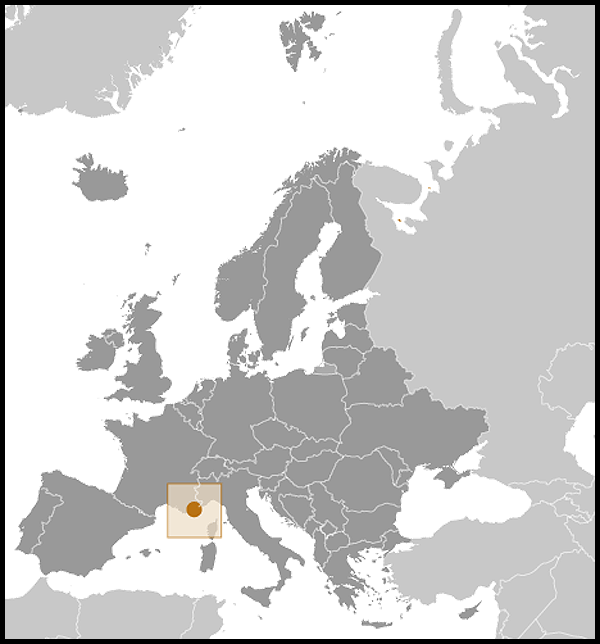 The Principality of Monaco is the second-smallest independent state in the world, after the Holy See (Vatican City). It is located on the Mediterranean coast, 18 kilometers (11 mi.) east of Nice, France, and is surrounded on three sides by France. 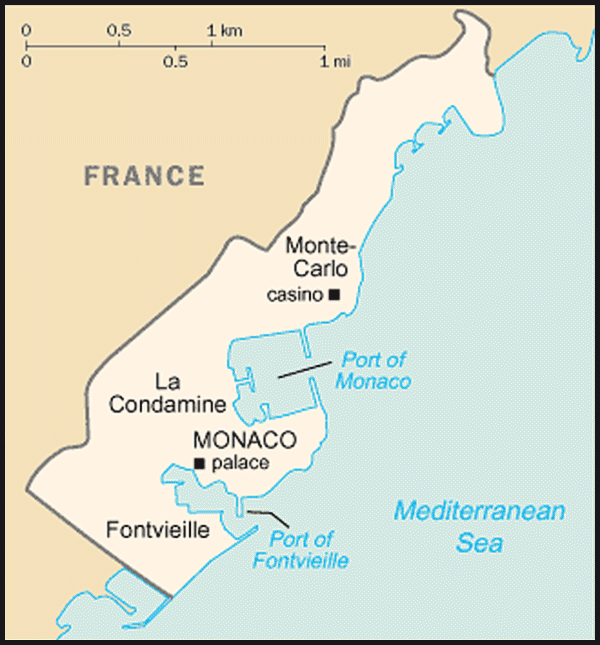 Monaco is divided into four sections: Monaco-Ville, the old city on a rocky promontory extending into the Mediterranean; La Condamine, the section along the port; Monte-Carlo, the principal residential and resort area; and Fontvieille, an area constructed on land reclaimed from the sea. In 2011 Monaco's population was estimated at 30,539, with an estimated average growth rate for 2011 of -0.124%. Under the 1962 constitution, the Prince shares his power with the unicameral National Council. Sixteen of the 24 members of this legislative body are elected by list majority system, and 8 by proportional representation to serve 5-year terms. The elections were last held in February 2008. If the Prince dissolves the National Council, new elections must be held within 3 months. Usually meeting twice annually, the Council votes on the budget and endorses laws proposed by the Prince. Monaco, located on the Mediterranean coast, has an economy primarily geared toward finance, commerce, and tourism. Low taxes have drawn many foreign companies to Monaco; the companies' production accounts for around 50% of the €850 million annual government income (approx. $1.13 billion; 2010). The enterprises pay a 33.33% tax only if more than 25% of their revenue is generated abroad. Ever since Monaco's famed casino opened in 1856, the tourism industry has been booming. It currently accounts for close to 25% of annual revenue. Monaco is noted for its activity in the field of marine sciences. Its Oceanographic Museum, formerly directed by Jacques Cousteau, is one of the most renowned institutions of its kind in the world. Monaco imports and exports products and services from all over the world. There is almost no commercial agriculture in Monaco. Monaco actively participates in the United Nations, which it joined in 1993. Monaco joined the Council of Europe on October 4, 2004. Monaco also is a member of several other international and intergovernmental organizations, including Interpol, the UN Educational, Scientific, and Cultural Organization (UNESCO), the International Atomic Energy Agency (IAEA), and the World Health Organization (WHO). The International Hydrographic Bureau (IHB) is headquartered in Monaco. In 2002, Monaco renegotiated its 1918 treaty with France. In 2005, it was ratified by both parties and entered into force. The terms of the treaty:Upgrade France's representation in Monaco from Consulate General to that of an embassy;Permit, for the first time, other countries to accredit ambassadors to Monaco; andFormally recognize the succession scheme set out in the 1962 Constitution, which extends eligibility to the Prince's daughters and other family members. Although not a member of the European Union (EU), Monaco is closely associated with the economic apparatus of the EU through its customs union with France and its reliance upon the Euro as its official currency. It is a de facto member of the Schengen Convention. Monaco has 10 diplomatic missions in Western Europe and permanent representation at the United Nations and the Council of Europe. It maintains honorary consulates in 106 cities in 45 countries. Seventy-six countries have ambassadors, consulates general, consulates, or honorary consulates in or accredited to Monaco. The U.S. Ambassador to Paris has been accredited to Monaco since 2006. The United States and Monaco enjoy excellent relations, which both countries seek to maintain and strengthen. From 1956 until her death in 1982, American-born Grace Kelly was married to Prince Rainier III, Prince Albert's father. In December 2006, the United States and Monaco upgraded from consular to full diplomatic relations. Shortly after, then-Ambassador Craig Stapleton (France) was accredited to Monaco. Ambassador Gilles Noghes became the Monegasque ambassador to the United States in December 2006. The United States does not have a diplomatic mission located in Monaco. The U.S. Consul General in Marseille handles most diplomatic and working-level contacts with Monaco. The U.S. Embassy (http://france.usembassy.gov/) in France is located at 2 Avenue Gabriel, Paris 8 (tel. (1) 4312-2222). The U.S. Consulate General (http://marseille.usconsulate.gov/) at Marseille is located at Place Varian Fry, 13286 Marseille Cedex 6 (tel. -(4)-91-54-92-00).